Decided to wear a tweed cape I'd bought at a trunk show about 5 or 6 years ago. Because I thought it looked fashion blogger-ish. One thing you should know before you run out and buy a cape: You'll probably have women stopping you in the produce section of the market, telling you how much they absolutely LOVE it. Always a plus. An ego boost, confirming that maybe, just maybe you do have some style after all. The other side of the coin? Capes - this one in particular - are NOT warm. No way. No sir. No how. So don't wear one out on a night when it's in the single digits and snowing. So there I was freezing my *ss off in Providence. Fancy tweed cape and all. Speaking of all, no complaints about the Kooba bag I also wore the other night. Got it at Scoop in the Meat Packing District in NYC, around the same time I picked up the cape (because sometimes even I get sick of carrying black bags around). 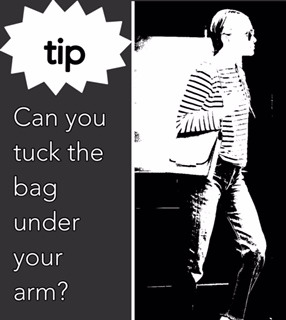 PS - The Kooba passes the test, but you cannot carry any bag under your arm when you're wearing a cape. Another drawback. Sheeeeesh. I bet other fashion-y bloggers don't tell you truth nuggets like that! Now about that hot chocolate. What should you do on a cold snowy night in PVD when you find yourself wearing a cape and freezing your Pure Barre *ss off? Don't know about you, but I decided to duck into the Coffee Exchange on Wickenden for a hot chocolate. True Story: In the past, I've had hot chocolate at other places (that shall remain anonymous) that's been too sugary and gotten terrible stomach aches. Not a good scene. And that made me kinda sorta hot chocolate phobic. It was just right papa bear. In other words, I could live on it every day or at least for the rest of this winter.